Dr. Ariyasinghe was born and grew up in Sri Lanka. He received B.Sc. (Hon.) from University of Sri Lanka in 1978. After working three years (1978 - 1981) as an assistant lecturer at the University of Sri Lanka, he attended Bowling Green State University (1981 - 1983) where he received M.S. in Physics. Subsequently, he attended graduate school at Baylor University (1983 - 1987) and earned the Ph.D. in Physics. After working one year as a lecturer at University of Sri Lanka, he joined Baylor faculty as a post doctoral fellow in June 1988. Prior to becoming an associate professor, he served as a lecturer (1990 - 1998), a senior lecturer (1998 - 2002), and an assistant professor (2002 - 2005). He enjoys traveling, working with children, and partaking in sports (cross-country, table tennis, swimming and cricket). 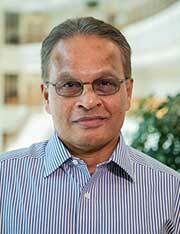 Dr. Ariyasinghe's research interests are in the area of atomic and molecular physics. He conducts research to understand the interaction of electron beams and ion (H+ and He+) beams with atoms and molecules. Electron scattering from alkenes in the energy range 200 - 4500 eV;, joint with P. Wickramachchi, P. Palihawadana, and G. Villela Nucl. Inst. and Meth. Phys. Res. B 267 (2009) 3391 - 3394. Total Electron Scattering Cross Sections of alkanes at intermediate energies, Joint with P. Wickramarachchi, and P. Palihwadana, Nucl. Inst. and Meth. Phys. Res. B 259 (2007) 841 - 846. Total electron scattering cross sections of Kr ans Xe in the energy range 250 - 4500 eV; Joint with C. Goains, Phys. Rev. A 70, 1050294 (2005). Total electron scattering cross sections of PH3 and SiH4 molecules in the energy range 90 - 3500 eV; joint with T. Wijerathne and D. Powers. Phys. Rev. A 68, 032708, (2003). Absolute K-shell ionization cross-section measurements of B produced by 0.4 - 2.0 MeV H+ and He+ ions and by 0.6 - 1.2 MeV H2+ ions; joint with D. Powers, Phys. Rev. A 59, 1291 (1999). Angular distribution of total LMM Auger electron yields produced by energetic He+ ions in Ar, Cl, and S; joint with P. Guo, A. Ghebremedin and D. Powers, Phys. Rev A 51, 2117 (1995). Effects of the molecular environment of the C, N, and O Auger electron yields induced by MeV H+ and He+ ions; Joint with R. D. McElroy, Jr., and D. Powers, Phys. Rev. A 36, 3674 (1987).